New York and New Jersey have declared states of emergency as huge Winter Storm Stella sweeps in, threatening blizzard conditions. 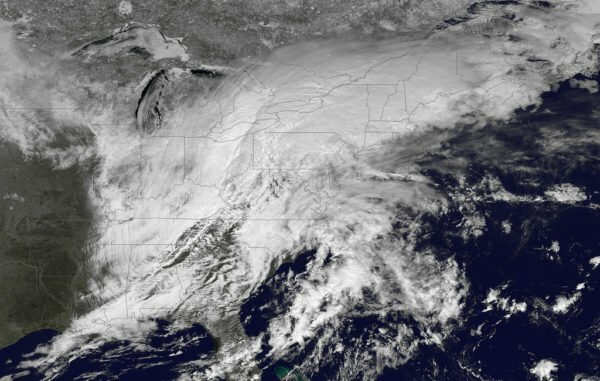 The National Weather Service has issued blizzard warnings for parts of Pennsylvania, New Jersey, New York and Connecticut. On March 14, schools are closed and thousands of flights have been canceled. The conditions caused German Chancellor Angela Merkel to postpone a trip to Washington to meet President Donald Trump. With winds of up to 60mph, Winter Storm Stella is likely to cause severe disruption for commuters across many parts of the north-east on March 15, forecasters say. A 24-hour blizzard warning was issued by the National Weather Service from midnight for New York, Connecticut and New Jersey. Storm warnings were also posted from southern Maine to Virginia. “During its height we could see snowfall rates of 1-3 inches (2.5-7.6cm), even up to four inches per hour,” said Alan Dunham, a meteorologist based in Taunton, Massachusetts. More than 6,500 flights have been canceled, tracking service FlightAware reported, with airports in New York, Washington, Boston, Baltimore and Philadelphia worst hit. Schools will be closed on March 14 in New York, Providence, Rhode Island and in some towns across Massachusetts and Connecticut. Declaring a state of emergency, New York Governor Andrew Cuomo said people should expect road closures, delays and cancelations. New Jersey Governor Chris Christie also declared a state of emergency and ordered all state employees not involved in the response to stay at home. Angela Merkel’s visit was planned for March 14 and has been rescheduled for March 17. Winter Storm Stella follows a spell of unusually mild weather in the north-east, with last month being the second warmest February since record-keeping began in 1895.